Femme Assise, Robe Bleu (Seated Woman in Blue Dress) depicts French photographer Dora Maar, Picasso's muse and lover. The artwork, which belonged to Picasso's dealer Paul Rosenberg in the 1940s, was seized by the Nazis during World War II. However, the French Resistance prevented it from leaving Paris. In the 1960s, the piece was acquired by art dealer and collector Ernst Beyeler. In 2011, Geneva-based collector Dimitri Mavromatis bought the painting for £18 million. The artist still holds the record for the most expensive painting ever sold at auction with Les femmes d’Alger, which sold for £138.64 million ($179 million) at Christie's in May 2015. 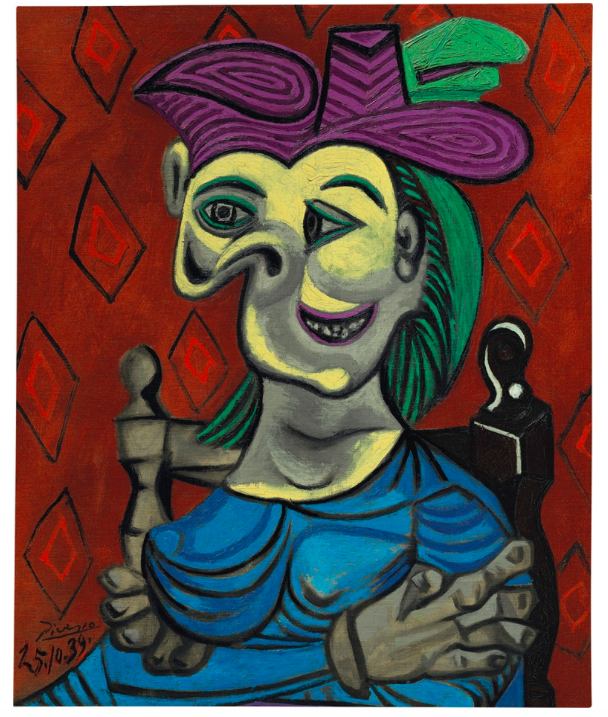 Picasso painted Femme Assise, Robe Bleu on 25th October 1939, the artist's 58th birthday. ''Femme assise, robe bleue exhibits all of the most exhilarating qualities that Maar brought out in Picasso’s work,'' explained Jessica Fertig, Senior Specialist in Impressionist and Modern Art in New York, ahead of the auction.